Eight hundred miles from the Falkland Islands and roughly the same distance from the Antarctic Circle, South Georgia Island is a desolate, isolated and wind-swept spit of rock, snow and glaciers some one hundred miles in length. Even during the height of the Antarctic summer, from January to March, the average high temperatures never even manage to reach fifty degrees Fahrenheit. During the depths of the Antarctic winter in June, it receives only 12 hours of sunshine for the month. The vast majority of the island is covered with steep, rugged mountains whose peaks rise up to 2,000 meters (6,562 feet) above sea level and remain perpetually shrouded in winter beneath an eternal blanket of permanent snow fields, ice caps and glaciers. The topography is slashed and crumpled by deep, twisting stone gorges whose bottoms have never seen the light of day beneath the numerous glaciers…roughly 160 of them…that fill the mountain valleys. In summer, the snow line only retreats to around 300 meters (984 feet). No trees or even small shrubs can manage to survive in the rocky soil of this polar tundra, only a few species of grasses, rushes and sedges. The majority of the plant life consists of various mosses, lichen and liverworts that grow low and cling to the very rock itself. Grytviken, the only human habitation on South Georgia Island in 1982, seemed an unlikely prize over which two world powers would go to war over. It’s only industry, a whaling station, closed in 1966. In 1982, the resident population of penguins out-numbers the human inhabitants by a ratio of perhaps tens of thousands to one and the only real settlements were the tiny town of Grytviken, with ten year-round residents, and a British Antarctic Research Station, two handfuls of buildings huddled along the shores of King Edward Bay. 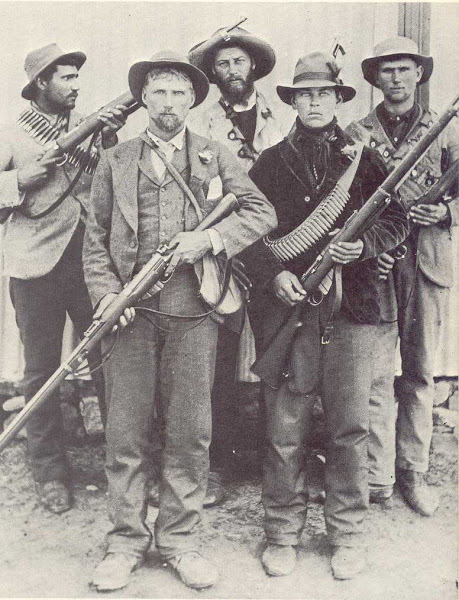 It seemed a rather unlikely place to fight, let alone start, a war, but that is exactly what happened. What may or may not have been a simple misunderstanding by an Argentine salvage crew who came to dismantle some of the derelict whaling station soon escalated into the Falklands War. The salvage crew, which included some Argentine Marines dressed as civilians, landed at Leith Harbor on 19 March 1982 and promptly raised the Argentine flag. The leader of the British Antarctic Survey team, on instructions from London, demanded that the Argentine party lower their flag, depart, and check in with official British government representatives in the Falklands proper. The Argentinians did lower the flag but refused to leave. The only Royal Navy presence in the South Atlantic at the time was the HMS Endurance, a fifteen-year-old 3,600-ton icebreaker whose bright red hull led to her being nicknamed the Red Plum. 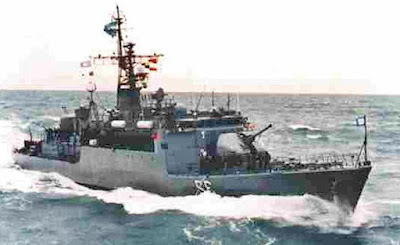 She was hardly a warship, mounting only two 20-mm Oerlikon anti-aircraft cannon, but her two small 1960’s vintage Westland Wasp helicopters proved deadly later in the conflict when they helped disable the Argentine Navy submarine ARA Santa Fe with hits from their 1950’s-vintage AS.12 anti-ship missiles. It was significant that the 22-man British Royal Marine garrison on South George Island was armed entirely with 7.62x51mm NATO rifles and machine guns. 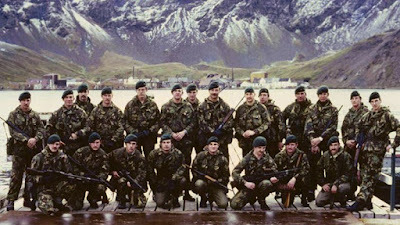 The British Royal Marine contingent on South Falkland Island, all 20-odd of them, were armed primarily with L1A1 SLRs, the British version of the Fabrique Nationale (FN) FAL, a 7.62x51mm battle rifle used by 90 nations (including Argentina) around the world during the Cold War. 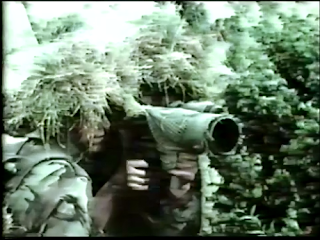 Some say the Argentine troops had the advantage since their FAL rifles were capable of full automatic fire while the British SLR was semi-automatic only, but with the 7.62x51mm cartridge’s recoil, shoulder-fired full-auto fire from an FAL is of dubious value except at rock-throwing distances. One man, Command Sergeant Major Peter Leach, was a crack shot trained as a sniper and had an L42A1, a sniper version of the venerable Short Magazine Lee-Enfield bolt-action rifle, converted to 7.62 NATO and fitted with an L1A1 telescopic sight, basically the old No. 32 3.5x scope retro-fitted with a thousand meter bullet-drop compensator calibrated for the trajectory of the new caliber in 50-meter increments. They were well provided with crew-served weapons since the Royal Marines had only recently decided to supplement the single General Purpose Machine Gun in each rifle squad with an additional light machine gun. Thus Mills’ force had two L7A2 “Gimpy” GPMGs and two L4A4 Brens, bipod-mounted LMGs converted to fire 7.62x51mm ammunition fed from a top-mounted 30-round magazine. The solid and reliable belt-fed GPMG could be fired from either its own integral folding bipod or from a tripod, the latter often used in conjunction with a telescopic sight. It was essentially a license-built version of the Belgian FN MAG-58 that has been used by some 75 nations around the globe since its introduction in 1958. After a few decades of trying to make a silk purse out of a sow’s ear, even the US Army finally dumped the old M-60 “Pig” and adopted the MAG-58 in the form of the M240B. Although the Royal Marines apparently lacked any armor-piercing ammunition, the standard British L2A2 7.62x51mm NATO ball round proved capable of doing considerable damage to aircraft and ships. 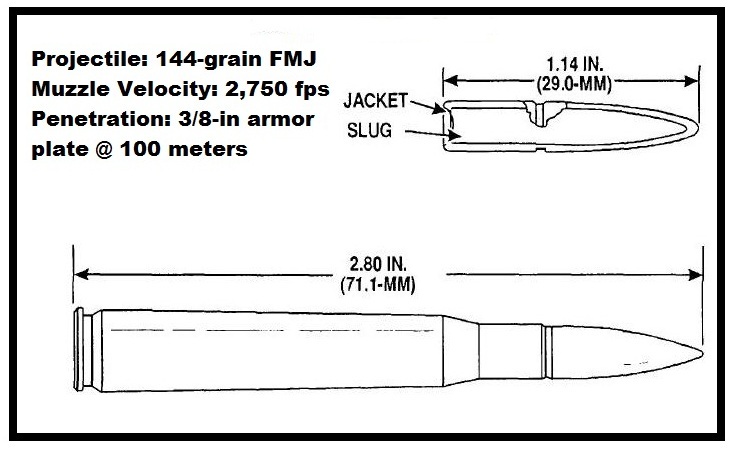 All the British small arms fired the 7.62x51mm NATO cartridge, essentially the same as the .308 Winchester. 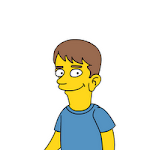 If the British possessed any armor piercing ammunition it must have been in small quantities and I have never found any reference to any being issued or used. The standard British 7.62mm service load was the L2A2 cartridge, firing 144-grain boat-tailed full metal jacket or “ball” bullets at a muzzle velocity of 2,750 feet per second. An “Old School” recipe dating back to the 1950’s, these projectiles consist of a soft lead core surrounded by a gilding copper jacket and are intended primarily for anti-personnel use. Even so, the standard ball projectile is still capable of penetrating ¼-inch of sheet steel at 300 yards, the old “steel pot”-style army helmet at 400 yards, and a 3.45mm NATO standard steel plate at 620 meters. The Marines’ only “heavy” weapon was one Swedish-designed 84-mm Carl Gustav recoilless rifle, commonly called the “Charley G” in British service. With an empty weight of over 31 pounds and each round of ammunition adding an additional 5.7 pounds of weight, the Charley G gunner’s slot was not a coveted position in the infantry. The weapon was, however, and effective bunker buster and its 1982-issue 84mm 3.75-pound shaped charge High Explosive Anti-Tank warhead was capable of punching through nearly 16 inches of main battle tank armor. They also had a few American-designed LAWS rockets, essentially collapsible lightweight throw-away one-shot bazookas. In fact, the LAWS rocket’s 66-mm warhead was the same diameter as the WWII-vintage 2.36-inch bazooka. Capable of penetrating up to 100 mm of armor plate, the 2.36-inch bazooka was a wonder weapon in 1942, but by 1944 it was proving ineffective against the new generations of German tanks and during the opening weeks of the Korean War in 1950 it was essentially useless against the North Korean Soviet-made T-34-85 medium tanks. Emergency supplies of the new 3.5-inch “Super Bazooka”, with its 90-mm warhead and 250 mm of armor penetration, had to be flown in directly from the Continental US. Yet when the US Army adopted the LAWS, it went back to a 66-mm warhead. The weapon proved quite useful against enemy field fortifications but on the few occasions it was actually used as an anti-tank weapon it failed, even against the thinnest-skinned armored vehicles in the Soviet arsenal, the PT-76 amphibious light tanks encountered in Vietnam. The Argentines had earlier landed a small, mixed ground force of Marines and sailors thrown together at the last moment, but the main South Georgia invasion force was Task Force 60.1 under the overall command of Captain Carlos Trombetta. 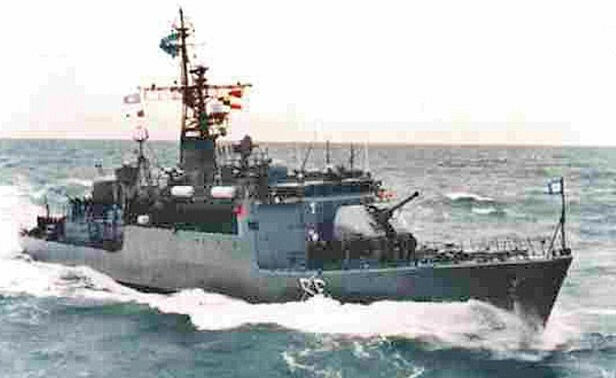 It consisted of the Argentine Ice Patrol Ship ARA Bahia Paraiso, which transported a detachment of Marines and a 15-man team of special naval commandos under Lieutenant Commander Alfredo Astiz. This vessel was escorted and supported by the corvette ARA Guerrico. 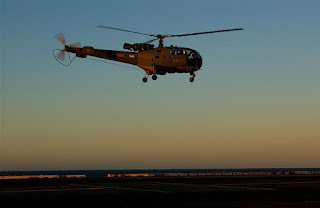 The two vessels also carried at least one (some sources claim two) Argentine Navy Aérospatiale Alouette III light helicopter and a larger, heavier Argentina Army Aérospatiale SA 330 Puma. Argentine Navy Corvette ARA Guerrico; not the kind of target ordinarily engaged by infantry. The ARA Guerrico (P-32) was a thoroughly modern warship only five years old at the time of the Falklands War. A French-built Type A69 Drummond-class corvette, she carried a crew of 84 men, was 260-feet long and displaced 1,320 tons fully loaded. Twin screws each powered by a SEMT Pielstick Diesel engine could drive her through the water at a top speed of 23.3 knots and she carried enough fuel to have a range of 4,500 nautical miles. On her foredeck she was armed with a single turret mounting a 100-mm dual purpose gun and she also carried two triple-tube torpedo launchers, depth charges, a 40-mm Bofors anti-aircraft cannon, two 20-mm Oerlikon AA guns, and a pair of Browning .50-caliber heavy machine guns. In the eyes of naval authorities around the world, however, her real firepower came in the form of her four rocket launchers, each of which contained a French-made MM38 Exocet guided anti-ship missile. But she carried essentially no armor. Much of her superstructure, in fact, was constructed of aluminum to save weight. The Fletcher-class destroyers the US Navy entered the Second World War with carried ½ to ¾ of an inch of armor and they were still quite realistically called and considered “tin cans.” Modern warships, however, carry very little, if any, armor. This would be a crucial factor in the highly unusual “naval” battle that occurred. The Argentine Marines were armed very much the same as the British, with FN FAL rifles and bipod-mounted heavy-barreled FN FALO versions of the same, which served as squad automatic weapons, as well as their own GPMG FN MAG-58s and they also landed a mortar crew with a light 60-mm mortar. The plan called for landing the Marines by helicopter rather than by small boat. When the ships appeared, Lieutenant Mills had walked down to the jetty to inform the Argentineans that if they tried to land troops they would be resisted. The first lift of Argentine troops aboard the Alouette thus landed unscathed nearby as the British Marines initially hesitated to fire without direct orders what could very well be the shots that would ignite a war. Then the Argentine Marines open small arms fire on Mills, who sprinted back to his platoon’s entrenchments. 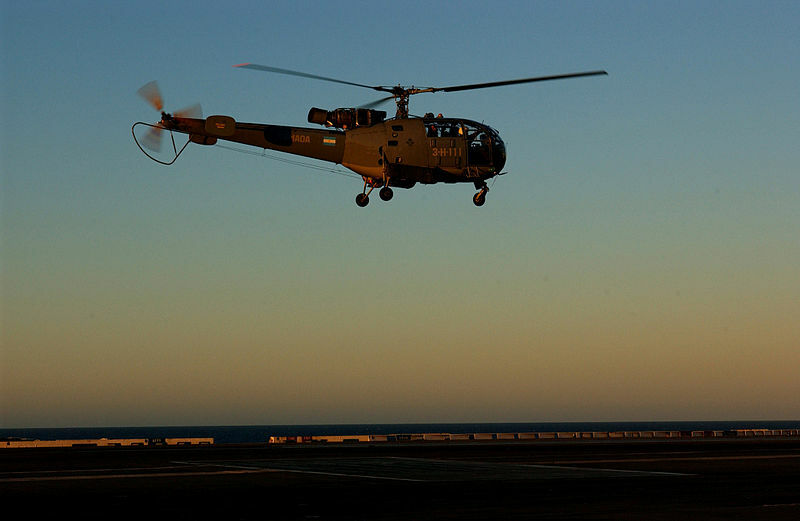 A few minutes later, the second Argentine lift arrived in the larger SA 330 Puma, carrying fifteen more Marines. As the big helicopter flared and hovered to land about twenty feet above the helipad at the Antarctic Research Station directly in front of the British field fortifications, Lieutenant Mills shouted out the command to, “FIRE!” One Royal Marine fired a LAW, but it missed. But numerous semi-automatic rifles and four machine guns poured out a hail of 7.62x51mm fire and at least 500 rounds perforated the helicopter within the first few seconds of fire being opened. Inside the Puma, the control panel blazed with red lights and warning alarms rasped in the earphones as hydraulic fluid sprayed throughout the interior, mingling with the blood of six wounded Marines, two of whom would die from wounds received within minutes. Fortunately for the Argentine Marines, the man at the controls, Lieutenant Alejandro Villagra, proved to be a superb pilot with quick reflexes. He instantly dipped the Puma’s nose down and fought for speed and altitude as he limped the smoking, shuddering bird across the cove and out of range of the British guns. Even as the last of the riddled hydraulic system failed for good and the bird began to die, Lt. Villagra managed to set the crippled Puma down almost gently in a forced landing on the far side of the bay. With a lesser pilot at the helm, all eighteen men in the Puma could have been killed when the bird crashed. Although heavily damaged by hits from some five hundred 7.62x51mm bullets, Lieutenant Alejandro Villagra managed to safely land this riddled Aérospatiale Puma out of range of British fire. A little over a month later, Argentine troops would do much the same. When the British made their amphibious landing at San Carlos Water to re-take the Falklands on 21 May 1982, a small detachment of about forty Argentine troops, again armed entirely with 7.62x51mm small arms, in short order shot down not one but two British Gazelle helicopters that overflew their positions. Having determined there was an apparently sizeable British ground force on South George determined to fight it out, the Argentine Marines from the first lift called for naval gunfire support from ARA Guerrico. An experienced career naval officer who had attended the Argentine Naval Academy, Captain Carlos Luís Alfonso responded immediately but as the corvette entered the bay she had to greatly reduce speed to avoid the semi-submerged and hard-to-see beds of thick kelp that grew in the restricted waters. Shallow shoals on either side of the main ship channel also restricted the vessel’s route. Even so, it was expected that the mere presence of the corvette, dominating the bay with its heavy guns, would be sufficient to secure the surrender of the British defenders ashore. After all, what lowly foot soldiers in their right minds would attempt to slug things out with small arms against a modern naval warship? At 11:55 the first naval gun opened up on the British Marines when Guerrico’s starboard Oerlikon 20-mm automatic cannon cut loose. One of the most widely-used light anti-aircraft guns of the Second World War, the Oerlikon L85 should have been able to sweep the British shore positions with an entire 60-round drum of 20x128mm High Explosive shells. This particular weapon, however, fired only twice before it malfunctioned and ceased fire. Almost a minute later, the twin Bofors guns mounted directly aft the bridge came to bear. These Swedish-designed L60 guns were supposed to belt out 2-pound 40-mm High Explosive shells at a rate of 120 rounds per minute from each barrel, but the Bofors crew didn’t do much better than the Oerlikon gunner. The left barrel spat out four HE shells before it jammed and the right gun got off only five shots before its extractor broke. At 11:59, with the Guerrico approximately 550 meters off the point, Lt. Mills ordered his Marines to open fire on the ship. They did so immediately and with great enthusiasm; even half a klick away, they could clearly hear the ringing cracks and pings of their 7.62mm bullets striking the ship. On the ship’s bridge the starboard windows were shattered by bullets and the walls of the adjacent radio room were perforated. In the 40-mm gun tub amidships, Petty Officer Patricio Guanca and his gun crew were huddled around the twin Bofors guns desperately working to get the malfunctioning weapons back into action. Royal Marine machine gunner Steve Parsons opened up with his Bren gun and, once on target, emptied the top-mounted 30-round magazine into their midst. Petty Officer Guanca was killed instantly, with two more of the gun crew wounded, and everyone had to sprawl flat on the deck to avoid more fire. Up on the bow, the turret-mounted French modèle 68 100-mm L/55 automatic multi-purpose main gun opened fire and lobbed a single 30-pound HE shell at the Brits before it packed up as well. Having ploughed through staggering waves during a storm in the notoriously rough South Atlantic seas en route to South Georgia, the complex automatic loading system for the ship’s main gun had become encrusted with sea salt deposits and the crew had not had the time to completely disassemble and clean it before the Guerrico went into action. While the crew was clearing the jammed loader, a Royal Marine fired a LAWS rocket that scored an incredibly lucky hit to the turret itself, jamming the 100-mm gun’s elevation gear in place. The Swedish-designed Carl Gustav 84-mm recoilless rifle made its debut as an anti-ship weapon during the Falklands War. Lastly, Royal Marine Dave Combes, in peacetime the steward aboard the Endurance, took aim through the 2x sight of his Carl Gustav recoilless rifle and fired at the corvette. The 84-mm rocket, staggering away at a velocity of only a thousand feet per second, actually skipped momentarily off the surface of the sea before slamming into the side of the ship’s hull near the waterline. The corvette’s hull plates, non-armored steel less than a half an inch thick, could do little to stop the blast of a HEAT warhead designed to penetrate 400 mm of tank armor. The Gustav blew an appreciable hole in the side of the corvette near the waterline and sprayed the interior compartment with blast, spall and shrapnel that severed cables and damaged the ship’s electrical system. Then the Guerrico’s course took it behind the buildings of the British Antarctic Survey Station and out of the Marines’ field of fire. Once safely out of range, the corvette coasted to a full stop while damage control parties attacked and assessed the warship’s wounds and medics did the same for injured crewmen. Still unsure about the total strength of the enemy forces ashore, Captain Alfonso was faced with a difficult choice, but no naval commander wants to be trapped in restricted waters unable to maneuver; if Endurance returned with her two missile-carrying helicopters, Guerrico would be a sitting duck in the harbor. His only real course was to continue deeper into the harbor where there was room enough to turn the corvette around and then run the gauntlet again through the single, restricted ship channel to once again reach the open sea. The Royal Marines on King Edward Point, now also trading intermittent small arms fire with the Argentine Marines who’d come ashore, readied themselves for Round Two of their match with the warship. With only Captain Alfonso, the helmsman and the quartermaster remaining on the bridge, Guerrico began its run back down the ship channel. Armed with his L42A1 bolt-action Lee-Enfield sniper rifle, Command Sergeant Major Peter Leach had run up to the second floor of the Shackleton House to gain a clear field of fire at the warship. With single well-aimed shots, he systematically shattered every remaining window on the corvette’s bridge, forcing the three Navy men at the helm to crouch and duck low behind the thickest parts of the ship’s superstructure as they steered the corvette through the shallows and kelp beds. Then the Guerrico once more cleared the buildings of the research station and the rest of the Royal Marines opened up with another hail of rifle and machine gun bullets. Combes got off another well-aimed 84-mm rocket from the Charlie G that hit and destroyed one of the corvette’s blocky Exocet missile launchers topside; fortunately for the crew, the Exocet’s own warhead did not detonate too. Then the ship passed out of range and gained open water again. With the shoot down of the larger Puma helicopter, Argentine Marines could only be shuttled ashore six at a time in the much smaller Alouette III. Meanwhile, the Alouette III had been shuttling Argentine Marines ashore a half a dozen at a time as quickly as it could, landing them safely out of range of British small arms on the south shore of the bay at a place known locally as “the Hummocks.” One lift included a 60-mm light mortar, which the crew set up to lob bombs at the British positions. The remaining Argentine Marines hustled along the open shoreline to Grytviken to link up with their mates and advance on the Royal Marines. The lead squads had already closed to within small arms range. When British Corporal Nigel Peters had risen up from his foxhole to fire a LAWS rocket at Guerrico on her outbound run, a sharp-shooting Argentine Marine quickly hit him twice with his FAL. Back at sea, Guerrico’s crew had managed to quickly get the 100-mm main gun’s turret and loading system operational again. Now, from far beyond the range of any British weapon, the ship could bombard the Marines’ positions with impunity. They quickly got the range and bracketed the Royal Marines’ field fortifications and began laying in a barrage of 30-pound High Explosive shells upon them. For another half an hour the Royal Marines hunkered in the holes when the shells fell, in between trading small arms fire with the slowly but steadily increasing number of Argentine Marines, who were using what cover there was to flank and eventually surround the British. The medic informed Lieutenant Mills that loss of blood had made Corporal Peters’ wounds life-threatening, their ammunition had started to run low, and the Alouette continued to increase the odds against them with every lift. Although by all accounts, including Mills’s, the NCOs and enlisted Marines were raring to continue fighting, the young lieutenant recalled his orders to avoid unnecessary casualties and felt that the fight they had put up was enough to satisfy British honor. Waving a white flag, Lieutenant Mills got up and advanced towards the Argentine Marines. An officer met him halfway and he requested to see the Argentine commander to arrange the surrender of his command. Argentine casualties amounted to three men killed and nine wounded as well as the loss of the Puma helicopter and the damage done to ARA Guerrico. 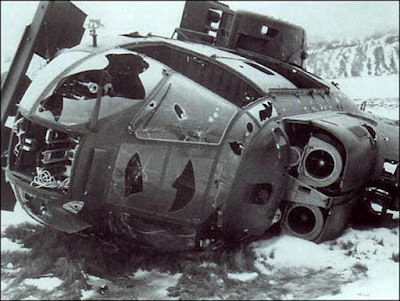 In addition to the damage done by the anti-tank rockets, the bridge and radio room alone had sustained approximately 200 hits from 7.62x51mm fire. 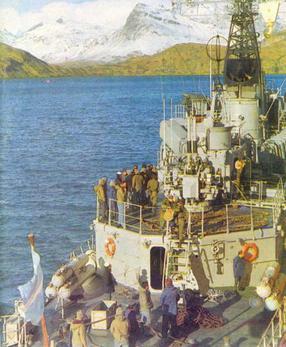 The Sunday Times post-war book claimed the Argentine Navy counted a total of 1,275 hits on the entire ship from small arms fire and several other accounts speak of “more than a thousand” total hits. Rear view of ARA Guerrico after the battle. The raised platform mounting the 40mm Bofors guns was where one sailor was killed and two others wounded by British machine gun fire. All this could not have been done with the 5.56x45mm NATO round the British adopted a few years later. Even without special armor-piercing ammunition, the rather elderly 1950’s-vintage “first generation” 7.62x51mm lead-cored FMJ projectile still demonstrates fairly impressive material penetration. British Army tests in 1960 determined that, at 100 yards’ range with 90-degree strikes, the 7.62x51mm FMJ bullet could penetrate a ¼-inch thick homogeneous steel armor plate (and five sheets of ¾-inch plywood behind it) and it achieved partial penetration (bulged out the rear) of a 3/8-inch armor plate. 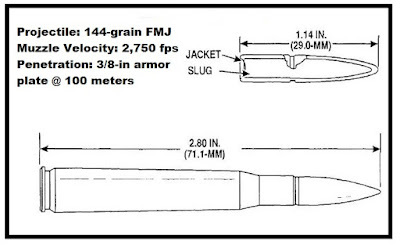 Against urban battlefield media, more recent US Marine Corps tests revealed that the old M80 7.62-mm ball round still penetrated about twice as much concrete and wood as did the 5.56x45mm NATO cartridge, even with the latter using the improved SS-109 62-grain round with penetrator core. In Iraq, the latter round even had difficulty in penetration automobile bodies and doors. Some have scoffed at the number of hits reported, 500 plus for the Puma and more than a thousand for the Guerrica. At the time, however, the average British soldier was required to individually hit man-sized targets out to 300 meters and to fire collectively as a unit out to 600 meters. The Royal Marines, of course, are not “average” soldiers, either. Just like the United States Marine Corps, they have a long-held tradition of and pride in their excellent marksmanship skills. And rather than a small, elusive man-sized target, a Puma represents a target 16 feet tall and almost 60 feet long, while the Guerrico was only forty feet shy of the length of a football field; either would qualify as the “broad side of a barn” category. Whatever the exact number of hits, they proved sufficient to destroy a 15,000 pound twin-engine medium helicopter and, after the action, ARA Guerrico had to return to the mainland naval port of Rio Grande where she spent three full days in drydock undergoing repairs to the damage she had sustained. The entire story from the British point of view can be found in the book Too Few Too Far by Malcolm Angel, one of the 22 Royal Marines who fought in the battle.